Window blinds can really do as much as we expect from them. They not only cover the windows, but they also stop entering irritating sun light into the room and also providing you with privacy. It also keeps safe your room from getting heat due to sunlight and it will also keep it dark and cool. If you require best and reliable window blinds for your home or office windows in Wakefield, then Impress Blinds would be the best choice for you to select. We provide a huge variety of window blinds for our customers across UK and Wakefield too. 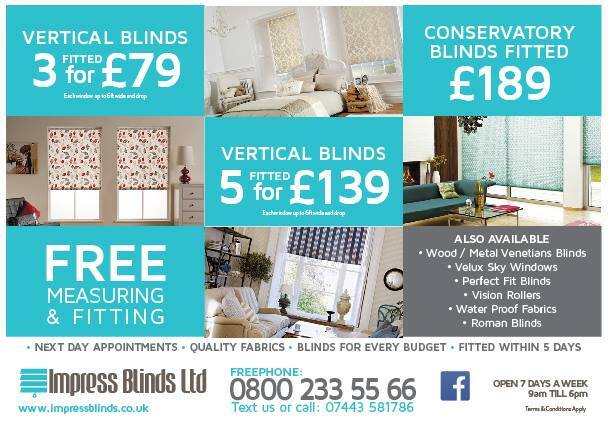 Our partner in Wakefield will deliver your ordered window blinds with in 3-5 days of measuring. Our personel will install the blinds according to your selected day. We work with trained and skilled people and they exactly know how to satisfy the customer need, because our first and most important requirement is customer satisfaction. We are well known for our services in the Wakefield area. We provide wide range of blinds at affordable prices. We have a vast variety of textures and some with very cheap offers. We proudly present vertical, roller, roman, conservatory, Venetian and wooden cheap window blinds in Wakefield. No doubt we only deal in good quality material and we provide the best thing to our valued clients. We have huge stock quality of fabric, different colors, textures and prints which will change the look of your selected area in your home. We provide free measuring and fitting service to all our valued clients. Once you select your window blinds, then our concern person will directly get in touch with. Our Blinds are made in UK and these are exceptional quality. We also offer 3 vertical Blind for £79 and you can easily get very next day appointment from us. We supply and install windows blinds within a week, we also give 12 month warranty on our window blinds in Wakefield West Yorkshire.